The Cuckoo-Roller is one of five endemic families in Madagascar, and there is but a single species, the Cuckoo-Roller (the superb shot, left, © Murray Lord). The head is large and rounded and looks out of proportion for the rest of the body, Early ornithologists described them as "lazy and stupid," but that was likely because they are fairly tame and easily shot (Perrins 1976). They are actually rather active and noisy, often flying up into the air in circles and loops, calling dree-oo dree-oo all the while. 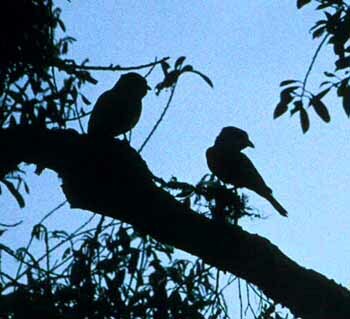 They are often seen in pairs, like the two silhouetted at right (© D. Roberson), and are essentially arboreal. Their diet consists mostly of large insects, and of lizards that they find among the branches and foliage. Fortunately, the Cuckoo-Roller is still widespread in the forest of Madagascar, occurring in the wet rainforests of the eastern escarpment (like Perinet Reserve where all these photos were taken) to the dry woodlands of the west (such as Ampijoroa and Zombitse). It ranges from sea-level to 2000m, and there is some local movements away from deciduous forest which lose their leaves in the dry season (Dee 1986). A second race occurs on the Comoro Islands. Nests are usually in holes in large trees. The sexes are dimorphic. Males (left; © Lillian Johnson) are mostly soft gray and have an odd velvety gray patch on and around the forecrown that makes it hard to see the small eye. The back, tail, and wings are dark green, and show glossy iridescence in good light. Males have a black stripe from the eye back across the nape. Females and immatures are mostly brown, marked with darker brown bars. Their wings are edged chestnut and show only a slightly glossy sheen on the remiges. In flight, both sexes have broad short wings, recalling small hawks, for which they can be mistaken as they fly in circles above the canopy (photo right © Murray Lord). That flight, though, unlike hawks, is slow, floppy and undulating, a combination of quick wingbeats and glides. In all, they are a distinctive and special feature of the avifaunas of Madagascar and the Comoros. Photos: The Cuckoo-Roller Leptosomus discolor shots on this page were all taken in Madagascar. Those attributed to Don Roberson or Lillian Johnson were taken in Nov 1992 at Perinet Reserve, eastern Madagascar. The two nice shots by Murray Lord were at Zombitse Vohibasia NP, on 12 October 2005. Photos © Don Roberson, except those attributed to Murray Lord and Lillian Johnson, who hold those copyrights, used with permission, all rights reserved. Family Book: There is no "family book" per se of which I am aware. 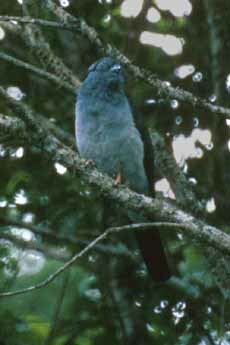 Nice photos of both sexes of cuckoo-roller are in Morris & Hawkins (1998). I expect that the Handbook of the Birds of the World project with have even more spectacular stuff when it appears. Perrins, C. 1976. Birds: Their Life, their Ways, their World. Elsevier Publ., Lausanne, Switzerland.